Their first bout ending in a scorecard debacle that left them with a sour tasting draw, Ian “Uncle Creepy” McCall and Demetrious “Mighty Mouse” Johnson will go head to head once again in the main event of UFC on FX 3 on Friday night in Sunrise, Fla. The winner will move on to face Joseph Benavidez for the first UFC flyweight championship at a future event. First, McCall and Johnson, as well as the rest of the UFC on FX 3 competitors, had to step on the scale on Thursday and hit the mark to make their fights official. Johnson went on an extreme diet to ensure that he made weight for his first fight with McCall. That wasn’t necessary this time and Johnson still had no trouble on the scale, tipping it at 125 pounds. McCall, who has long fought at flyweight, also had no trouble hitting the mark, weighing in at 126 pounds, which includes a one-pound allowance since this is a non-title bout. 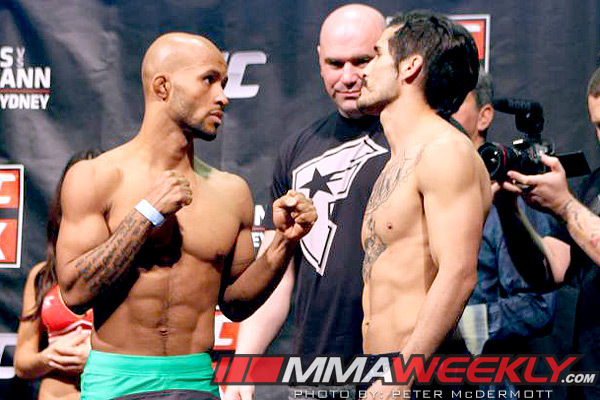 Demetrious Johnson vs. Ian McCall is now officially the first flyweight headlining bout in UFC history.